By now, you might have heard about the new Bacon Shake at Jack in the Box. News broke last week, and the internets have since exploded with opinions on the porcine treat. Some people say it’s amazing because it has bacon and ice cream, while others say it’s just another way for fat Americans to clog their arteries. I can see both sides of the argument. Bacon and ice cream are both delicious. Then again, so are fruit and cake, and we all know how that turned out. As for the arteries, it will definitely clog them. The regular size has 773 calories, 28 grams of saturated fat, and 127 milligrams of cholesterol (1081, 37 and 184 in the large). Wilford Brimley will surely love it. The Bacon Shake was released along with the BLT Cheeseburger as part of Jack in the Box’s Marry Bacon campaign, which is quite funny. Supply is “as limited as limited can be … so go get one right now.” But BLT Cheeseburger? Really Jack? I’m sure people will get really excited about that. I do like the Marry Bacon commercial, though. Good stuff. Jack in the Box is clearly trying to capitalize on the bacon craze that has been sweeping America for a while now. Personally, I think the whole bacon thing has gone way too far. Don’t get me wrong, bacon is good, just not good enough to put it on a maple bar or cover it in chocolate. I like bacon two ways: on a burger/sandwich, and by itself. It definitely should not be paired with anything sweet. I’m also not fond of anything that’s bacon-flavored. They never seem to capture the true taste of bacon. Needless to say, I was not expecting much from the Bacon Shake. In fact, I was really expecting to hate it. Vanilla ice cream, Torani bacon-flavored syrup, and whipped cream just does not make my mouth water. Actually it kind of does, but not in the Pavlovian way. You know when you’re about to hurl and your mouth fills up with saliva? That way. Despite all of that, I made my way to Jack in the Box. I got the Regular size (16 oz. ), which goes for $2.89. The drive-thru technician told me it tastes “weird,” and that I was the third person to order it. The Bacon Shake has an interesting hue. Sort of light orange-pink. But how does it taste? I’ll tell you how it tastes: terrible. I took three pulls before I couldn’t stand it anymore. It’s likely the most vile flavor my taste buds have ever encountered. I really don’t even know how to describe the flavor. It definitely does not taste like bacon. It’s sweet with a very artificial smokiness. I couldn’t help but think, people at the Jack in the Box test lab obviously tasted this and said it was good, otherwise it wouldn’t have been released. How anyone in their right mind could deem this product acceptable to distribute to the masses is beyond me. I would rather lick a urinal cake from a Jack in the Box bathroom than have another Bacon Shake. But other than that it was great! Some of you will still want to try the Bacon Shake, even after reading this. To you, I say good luck. Also, hurry because it’s available for a limited time only, although that could just be a gimmick by Jack in the Box. It’s probably for the better though, because I believe the Bacon Shake is just disgusting enough to wipe out the entire human race. Will you try the Bacon Shake? Have you already tried it? What did you think? I am not a big shake fan from fast food places and I agree with on bacon flavoring. It never tastes rights. However I have to strongly disagree with bacon and sweet combination. 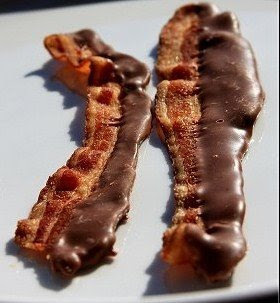 Bacon and chocolate (especially dark chocolate) go very well together. The saltiness of the bacon brings out the flavor of the chocolate (like say sea salt does) and adds a nice textural component. This bar here – http://www.amazon.com/Vosges-Haut-Chocolat-Mos-Bacon/dp/B001LMT1CY is down right awesome, IMHO. So, how do you really feel? If I were thinking of trying this, my mind has been changed! I agree that bacon and sweet is a very difficult thing to balance, best left to true professionals or morons. I guess I’m either a bigger fan of bacon than most or that my tastebuds were shot off in the war but I think it’s a winner. Maybe the Jack in the Box employees in my area make them better than elsewhere or perhaps the critics just outnumber the fans. For a glimpse at the other side of the coin, should you not be brave enough to draw your own conclusions, you can read my (glowing) review at baconscotch.com. In summary, I didn’t suffer from any aftertaste and I though the vanilla/bacon balance was spot on. To each his own, I suppose.